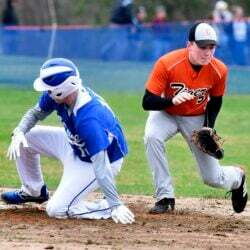 Program based in Hallowell wins U18 title for third consecutive year. The only person on the Maine Moose bench who felt any nerves was the head coach, Jeff Ross. 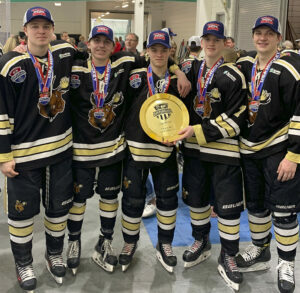 The Maine Moose won the USA Hockey Tier II U18 2A National Championship on Monday in San Jose, California, taking a 6-3 win over Arizona’s Mission Red in the title game at the Solar4America Ice complex. Andrew Bertolini had two goals in the win, while Brenden Gasaway made 21 saves. 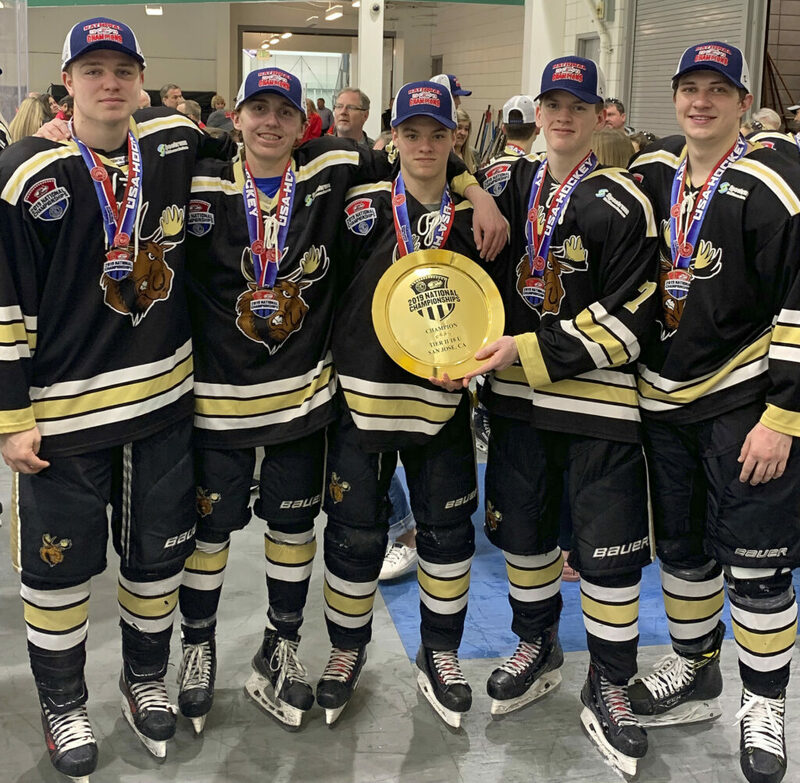 The win marked the third consecutive national championship at the U18 level for the Maine Moose, which is based out of the Camden National Bank Ice Vault in Hallowell. The Moose went 4-1 during the tournament, which began last Thursday and concluded with Monday’s title game. The team’s only loss came to Mission during the round-robin portion of the tournament. Having a chance to avenge the only loss of the tournament was important, Zach Whitney, of Chelsea, said. For Whitney, the feeling of winning a national championship took on added significance. The Cony High School senior tore his ACL during the high school soccer season — after the Moose had secured the Maine state 18U title — and, under advice from doctors, postponed any surgery until after the hockey season was complete. He was one of four defensemen Ross employed during the national championship tournament. “He was just amazing for us,” Ross said. West Gardiner’s Joe Clark led the Moose in scoring at the nationals with six goals and 10 points, tying for the tournament lead in both of those categories. Oakland’s Dylan Cunningham also finished with 10 points in five games, while Whitney, a defenseman, had three assists. Poirier and Warren Karlberg, also of Gardiner, each added two points. The Moose jumped out to a 4-0 lead in the first period against Mission, but the Red clawed back to within 5-3 midway through the third. That’s when Gasaway stopped a shorthanded breakaway chance for Mission and Bertolini sealed it with his second of the day — an empty-netter with 40 seconds remaining in regulation. Gasaway, of Old Town, finished the tournament with a 2.65 goals against average and a .939 save percentage. His save percentage was best among all netminders who played in more than one game. Ross said he believed his team was destined for good things following a 3-1 win over the Affton (Missouri) Americans in the opening game of the tournament.